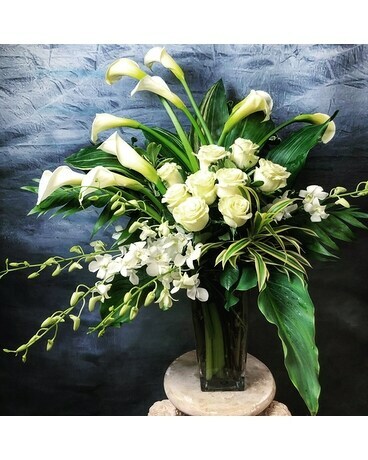 This breathtaking arrangement consists of white calla lilies, rose and dandrobium orchids. Shown version is standard, deluxe version will include more roses & orchids. As always, we reserve the right to substitute for similar plants at equal value or more to ensure your order is delivered in a timely manner. If you are keen on the types/colors of flowers in this arrangement and prefer no substitution, please give us a call to inquire before placing your order.